Oceanfront homes, lakeside properties and even residences along the river tend to attract higher-than-average prices. However, according to a new report from Zillow’s research team, that premium on waterfront real estate has declined in recent years. Based on its analysis of sales data between 1996 and today, Zillow found that waterfront residential properties in the U.S. sold at a 36 percent premium on average, down from the 54 percent premium these listings fetched in 2012. Between 1996 and 2018, the waterfront price premium has averaged 41 percent. This would appear to indicate a softening market for residential real estate located along a body of water. Zillow noted that while waterfront home prices grew faster than those of all other homes before the 2008 crash, they have yet to recover their lost value since the housing crisis. Researchers draw parallels between this trend and another recent finding that homes in popular vacation destinations have also not recovered the value lost after the housing bubble burst. The national trend toward lower waterfront premiums has not touched all local markets in the same way, however, with these homes still attracting significantly higher prices or having regained lost value in some cities. 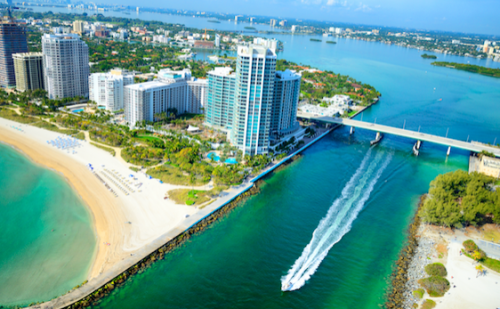 Zillow pointed out that Miami-area waterfront homes have mostly regained their pre-crash average premium of 40 percent. The waterfront premium of any one city is also a function of its geography and the characteristics of its housing market in general. For example, although waterfront homes in Denver, Sacramento and Austin have fetched some of the largest premiums since 1996, Zillow noted that these cities just have a very small amount of water-adjacent developed land available. 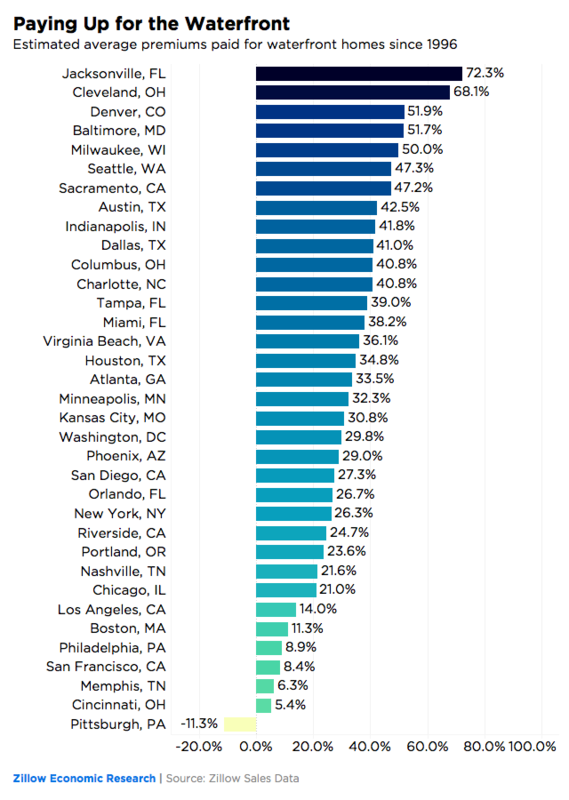 In already expensive markets like Los Angeles and San Francisco, waterfront premiums are relatively small, but the sheer cost of a typical home in these cities means buyers aren’t exactly getting a bargain. Overall, Zillow estimated that waterfront homes represent $134 billion of total real estate value in the U.S. That’s despite the fact that only 0.4 to 0.6 percent of all U.S. real estate transactions each year involve houses along the water.